Start your day here at the specialty coffee bar with beans from the Upper Peninsula, or stay a bit longer and enjoy their delicious light lunch and dinner menus. 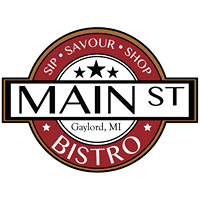 Main St. opened during the summer of 2016 and instantly became a hit among the younger crowd of Gaylord. Market isn’t just a word in the name — the business also features a specialty grocery where you can shop for cured meats, fine wines and more. Find the menu here. Facebook here.